UDM Downloads > ICE License! 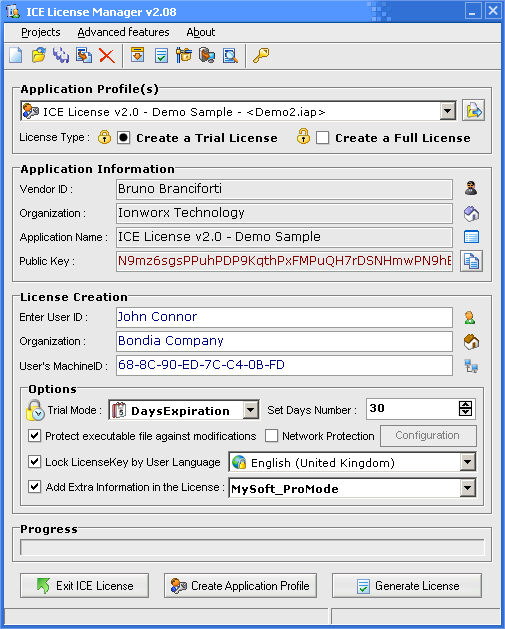 ICE License Protection is providing a high barrier against illegal copy using the power of Elliptic Curvesl Asymmetric Encryption to protect your application. Elliptic Curves encryption system allow transmission of secret information over an open channel without a common secret key previously shared between the ends.ICE License Features : * Antidebugging & Antimonitors Protection (protect against Code Tracing) * Sophisticated Asymmetric Encryption Technology (prevent against Key Generator) * Advanced Digital Autentification to prevent against patching * Advanced Code Encryption Protection to prevent against crack or dump * Transfer License to another PC (Trial License or Full License) * Create Key Generator for your partner or distributor - Network LAN Control Protection by TCP/IP Protocol (in Trial or Full Mode) - Detects backdating or demo reinstallation to gain additional usageICE License Protection can help you prevent key generator.